Fair Saint Louis visitors can avoid massive traffic jams, blocked highway exits, closed St. Louis streets, and paying too much for parking by taking Metro Transit to the popular three-day celebration. Metro Ambassadors will be out 6 p.m. to end of revenue service July 2 -4 at most downtown MetroLink stations to help guide passengers and keep the crowds moving. Looking for us if you need help! DAYTIME: MetroLink will operate every 15 minutes on the Red and Blue lines from 9 a.m. to 6 p.m. resulting in a train stopping every 7 to 8 minutes between the Forest Park-DeBaliviere and Fairview Heights MetroLink Stations. EVENING: Starting at 6 p.m., MetroLink will operate every 12 minutes on the Red and Blue lines with trains arriving every 6 minutes between the Forest Park-DeBaliviere and Fairview Heights MetroLink Stations. The #99 Downtown Trolley will be rerouted as a shuttle during the parade. One shuttle will take passengers back and forth on Olive from Leffingwell and Olive to Tucker and Olive. The shuttle will operate every 15 minutes from 10 a.m. to 1 p.m. The other shuttle will provide service on Washington from Beaumont east to 14th Street and from 14th Street north to Cass and Cass east to 10th and Cass to 9th and 9th and Cass and back. That shuttle will operate every 40 minutes from 6 a.m. to 2 p.m.
From both shuttles, passengers can transfer to the Civic Center Transit Center or to other routes. The #99 Downtown Trolley will go back on its regular route after the parade. MetroBus will operate on a regular Sunday schedule. Thanks for the post clarifying Mike’s previous question. Sadly, this is exactly what I suspected we’d get – the painted 99 gets moved, the parade happens, the painted 99 gets returned. There are a few extra trains. Of course the kicker is – nobody knows about them, because Metro doesn’t advertise anything not painted like a toy. Why is there no prominent link to the fact you’ll have extra trains on Metro’s own website? Why isnt there a temporary section of the website dedicated to the 4th of July weekend? Thats just silly. You want people to utilize a service, they need to know it exists. This is a major holiday in the US, with large crowds downtown, and yet other than this blog, I have seen no mention of Metro’s “efforts” to provide extra or modified transit anywhere. I’ll go back to it – Metro has zero idea how to market. Look at MTBA in Boston, BART in San Francisco, Metro in Washington DC, SEPTA in Philedelphia, King County Transit in Seattle…even DART in Dallas, and Houston Metro transit (mostly a massive bus system) – ALL of them have areas of their transit websites dedicated to changes for the 4th of July. And not all of them have big events downtown like we do. 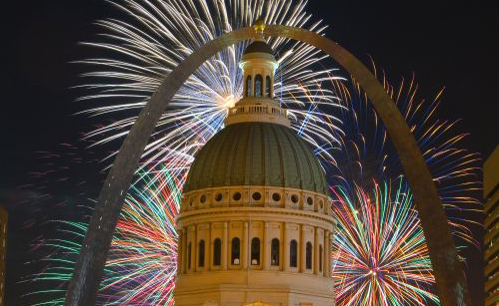 What does Metro St. Louis have on its website regarding the 4th of July? Nothing. Your Rider Update and Alerts ticker has the occasional Veiled Prophet ticker, and VP Metrolink. But unless you stare at the RU&A scroll for a few minutes (like I did), you’d likely never see it on a quick glance. Reroutes, updates, and “extra services” for the 4th and the VP Fair should be PROMINENT on the website. You should have had radio ads a week ago. Definitely agree that there needs to be information more prominently displayed on the website, and we are working on that right now. Just saw the update to the website – thank you. One question I do have for you, Courtney – how come in your post you don’t mention the other routes that are being changed/rerouted/affected – 4,10,11,30,32, etc? I realize you are trying to promote the 99 shuttle service, but regular riders of those other routes will be affected too (if Metro’s website is accurate). O please….Good idea Metro!!! It certainly will help.